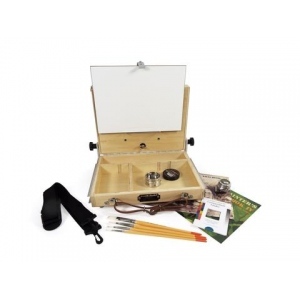 This easel gives you the freedom and flexibility of a French easel without all of the hassle. 2 in 1 design allows you to paint any size panel or canvas from 4” x 6” up to 16” x 20” and carry it home. Can be used with a standard camera tripod or on a tabletop. When you are done painting, you can close up your box and attach your wet painting to the outside of the box, facing in. 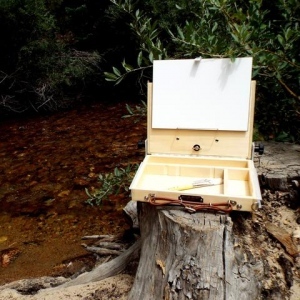 Simply place the stainless steel shelf on the outside of the lid and rotate the telescoping easel - your painting will be secure as you carry it home.